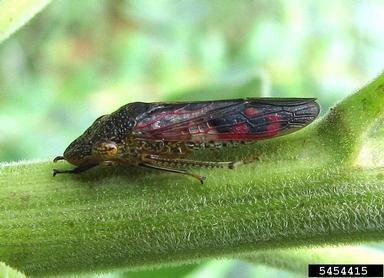 The Glassy-winged sharpshooter (Homalodisca vitripennis) is a native to northeast Mexico and the southeastern US, but has recently spread to California and is becoming a detrimental pest of a wide variety of agricultural crops. The main concern with GWSS is that it reproduces quickly and while feeding, may infect the plant by vectoring the bacteria Xylella fastidiosa, which is linked to major plant diseases. To date, it has not been found in Wyoming. Fifty-nine total traps have been placed throughout ten Wyoming counties since 2010. The Glassy-winged sharpshooter portion of the Small Grains and Grape Commodity Survey began in 2010 and is conducted by the Wyoming Pest Detection/CAPS Program. A yellow sticky trap is placed on or near the host plant from late May through August. The traps are monitored for suspects and serviced once a month. If suspects are found, they are sent to the University of Wyoming for further identification.